One of the more challenging decisions you have to make when you have 6 kids is finding the best large family car that is comfortable for everyone to ride in and also gets decent gas mileage. We spent a lot of time researching cars that would work for us, and truth be told- there aren't a lot of options out there- especially if you want seating for more than 8 people! 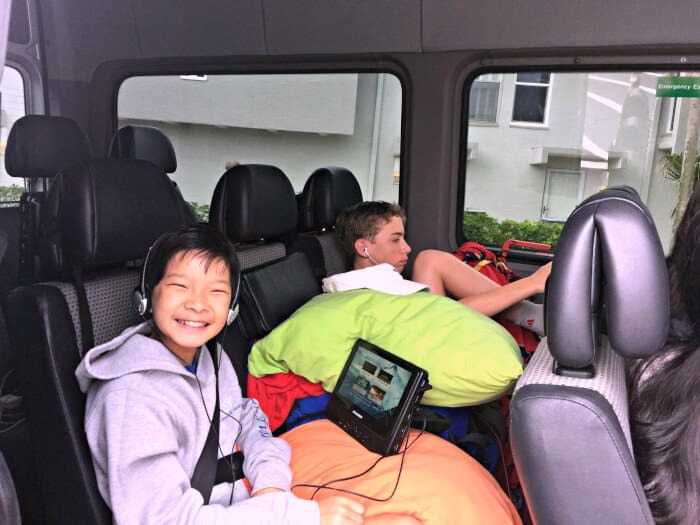 We bought our Mercedes Sprinter 9 years ago- and it was really a perfect choice for our large family! This “Mommy-bus” comes equipped to handle 12 passengers- which means my kids plus four soccer teammates! Even super-sized SUVs wouldn't give me the option of carpooling- so that is a huge plus for us! And what's really cool- it's that it is very tall. You can completely stand up in it- so when you are cruising down the highway on a 12-hour road trip to Grandma's, and the DVD player in the back row stops working- you can just unbuckle from that front passenger seat and stroll right down the aisle to the back of the bus and render some technical assistance- without all of that cumbersome stooping and climbing over seats! And just look at that driver's seat…. is that luxury or what? 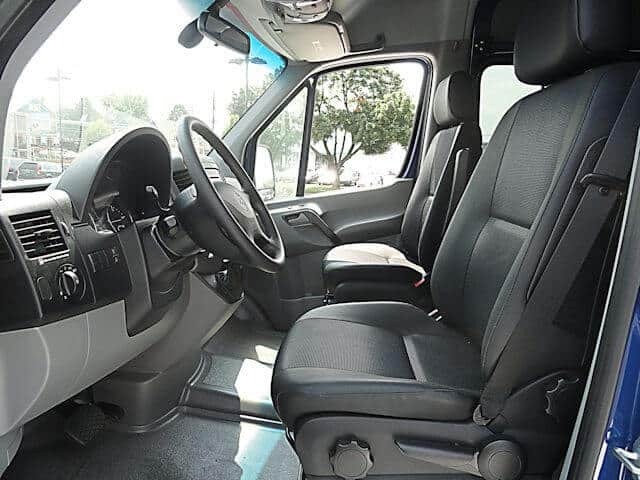 18-wheelers everywhere will be jealous of your faux-leather interior and your heated seats! Ahh…. just take a look- is that a jetliner? No- that is the four, yes count them, four rows of luxury seating- enough to seat 10 passengers behind the front row! Each of the rows has the same amount of legroom- unlike many 8 passenger SUVs where the third row is tight and cramped. This is so important as your kids grow up- you can't fit lanky teens in the third row of many of those cars! 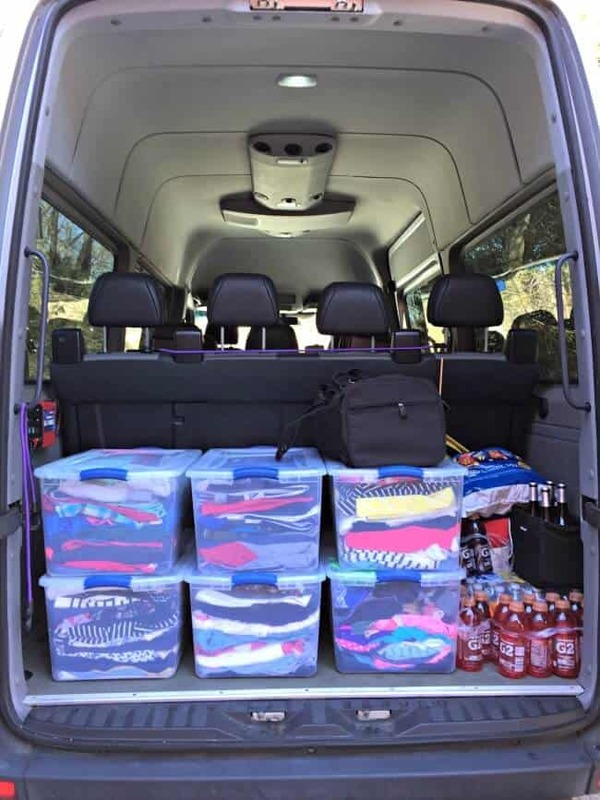 And would you just look at the cargo space! Seriously- we could almost LIVE in this car! But all kidding aside- this truly is the best large family car! I truly love my Mercedes Sprinter passenger van. After 9 years we have taken dozens and dozens of long-distance road trips- putting more than 165,000 miles on it- and it still runs beautifully. It gets excellent gas mileage- 20-21 miles/gallon. It has a diesel engine and currently diesel fuel is more expensive than regular unleaded gasoline, but over the course of owning this car there have been times that diesel fuel has been cheaper than gasoline. I do not need a special type of driver's license to drive my Sprinter, it is considered a regular passenger vehicle. And it really is not very hard to drive or park (except maybe parallel parking). It is tall- 9 ft 6″- which means that I cannot drive it on many of the parkways in the Northeast because of low bridge clearances. And I cannot take it through many fast-food drive-thru windows, again because of the low clearances. And sometimes when I am driving in windy conditions- the tall profile of this van leads to “shimmying” as I drive- which is something to keep in mind. And no, it does not have bunk beds or a toilet in it (as so many people stop to ask me). Why is the Sprinter right for us? The reason we bought this car a few years ago was because when we jumped from 5 to 6 kids we could no longer fit in my old mini-van and the only option in a “standard” type of car was of the Suburban/Tahoe sized range- and all of our kids were still in car seats or booster seats at that time. Even those large vehicles couldn't handle running 3 car seats or boosters seats across each of 2 rows and leave enough room for kids to easily reach down and buckle their own seat belts (which was a requirement of mine!). So we really felt that our best option was to start looking into full-sized passenger vans and after doing quite a bit of research- we felt that the Sprinter (a Chrysler product back then, but now exclusively a Mercedes product) offered the best price, the best fuel economy, and the best options for “extras” such as heated seats of any of the full sized passenger vans on the market at the time. Now some people hear the label “Mercedes” and assume that I am driving an uber-luxury car, but that just isn't the case. This is really part of their truck division- and it is much more of a very nice truck than a luxury SUV- and at half the price of those decked out 8 passenger SUVs. 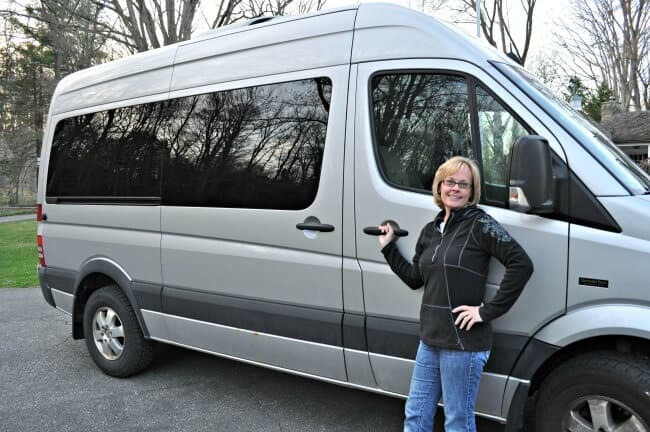 I really do love my Sprinter van- and feel that is is the best large family car on the market! How Old Should Kids Be to Play Call of Duty? Teaching Tweens “Why is Community Service Important?” 15+ Service Projects for Kids! « How to Get to Inbox Zero! I love your Mommy-bus. It comes in handy when you have to pick up their friends as well. I had a Ford Expedition, but sold it. Now I’m looking for a replacement that does better on gas. Thanks for sharing! 12 to 15 traveler auto is best for school trek or composition outing and family or companion trip . Since single vast van is superior to anything at least two autos and we can appreciate more our excursion together. And furthermore can convey our stuff in a similar van. I read your article properly. Your article is really great and informative. Thank you for shear it. Ok. So, I found and read this post randomly at 3am after sobbing and not sleeping from anxiety about how we bought a Sprinter yesterday and it feels too big and ridiculous and there are no take backs on our contract. You gave me a little calm and hope that it is going to be okay. I will stop being scared. I will be capable. 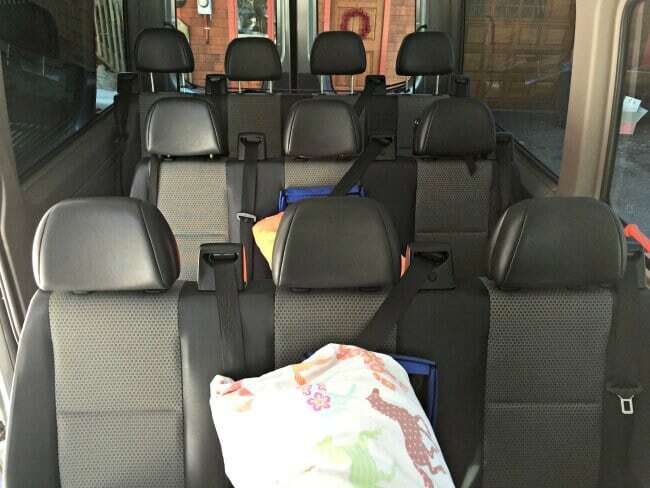 I will have space for 6 carseated kids without climbing over a hatch or not having room for the stroller. This post was my only 3am solace. Thank you! And pray for me! Oh my gosh this is the very situation I find myself in right now! I am currently lying awake filled with anxiety over the purchase of our Sprinter. Please tell me it will pass and I will grow to love this massive vehicle…. You just have to embrace the fact that you will be diving a very tall vehicle that fits a lot of people! Own it – and love it! I know that I do! I can’t believe that 4 rows of seats fit into that van. That is exactly what I need for all the kiddos I have to take to soccer practice. Great job on the transportation and keep up the good work! HI Sharon, thanks for your overview. 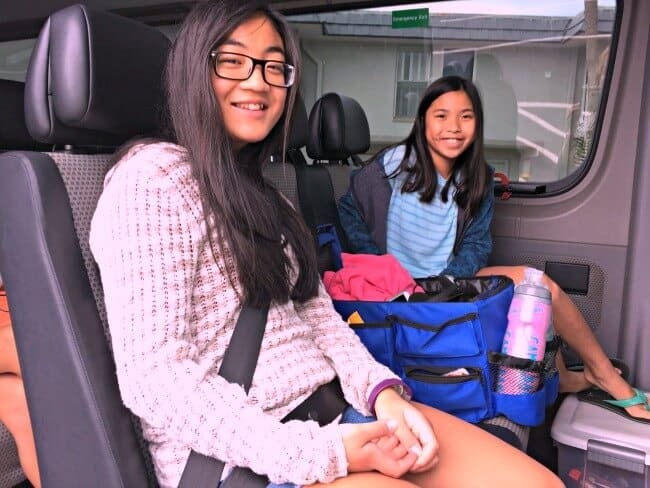 We are a family of 8, too, and are looking to replace our 2003 tried and true Suburban (giving it to daughter going off to college) – and want to know 1)If you pull an RV or cargo trailer with your Sprinter? And if so, does it do a good job? 2)Do you have 4wd, and how does it handle in the snow. Thanks for the reply ! We have a tow package but it has only been used for a bike rack- never to tow anything. And quite frankly- it stinks in the snow. It is rear wheel drive only (although now I do believe they make a 4WD version of a Sprinter). 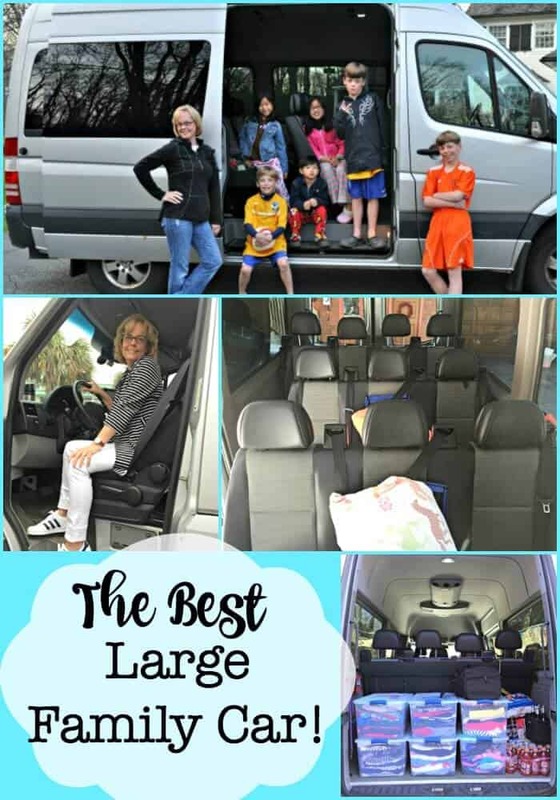 I enjoyed reading about how this vehicle is perfect for your big family. Thanks for sharing! We were recently surprised by the arrival of twin boys. Our “one more baby” suddenly transformed us into a family of seven. Our original plan was to pick up a used minivan, but it was pretty clear that such a vehicle would no longer be a practical choice. And as you said – it especially wasn’t going to work with everyone still in car seats. Congrats on your twin boys! And thanks so much for sharing your solution! We are looking for a vehicle for our 8 person family. We live in the mountains and get a lot of snow. How is the short school bus in the snow? The Sprinter that I drive is an older model- and is a rear wheel drive car- which makes it not at all good in the snow. I do believe that the current models are available with front or all-wheel drive. You would have to check. Thank s for sharing this post. Its very easy for long family…while the tools of your vehicle fit and timely repair .Although if you you want to avoid the driving then you can hire vans for your trip and no problem will be created with you and your family.